TEAM Unlimited LLC, owners and producers of the XTERRA World Tour, has entered into a television distribution partnership with Icarus Sailing Media that will significantly increase XTERRA television programming in Europe and beyond. Honolulu, HI (March 31, 2016) – TEAM Unlimited LLC, owners and producers of the XTERRA World Tour, has entered into a television distribution partnership with Icarus Sailing Media that will significantly increase XTERRA television programming in Europe and beyond. Icarus Sports, which annually distributes more than 20,000 hours of content through 85 broadcasters and 160 territories, recently expanded into outdoor sports and views XTERRA content as a valuable addition to its current offerings in water sports programming. “Icarus Sports is very proud to partner with XTERRA and provide our world class distribution service to this amazing event,” said Jason Georgaris, Icarus Sports Chief Executive Officer. The new distribution stream with Icarus Sports in Europe will complement XTERRA’s existing U.S. distribution that includes airings on ABC, NBC, CBS, FOX, and FOX Sports Network, it’s international programming with ESPN stations in Oceania, Canada, Latin America, Japan, and the Caribbean, as well as its upcoming online distribution with Amazon Fire TV. The partnership begins this May with European distribution of the one-hour 2015 XTERRA World Championship show, with plans to add the hour-long XTERRA Pan American Championship and the 8-part XTERRA Adventures series of half-hour programs shortly. 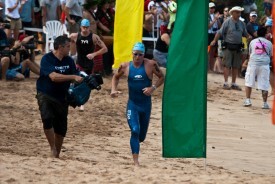 Details and a broadcast schedule will be available at xterraplanet.com/television. Icarus Sports is the leading media & marketing company specializing in the sport of sailing, outdoor events and water sports. Founded in 2008 as Icarus Sailing Media, Icarus Sports is now active in 45 countries in all continents with more than 25 employees and offices & partners in Athens, Istanbul, Incheon and Rio De Janeiro. In 2011, Icarus Sailing Media won the “Rising Star Award” from the Enterprise European Network for its innovative business model. Icarus Sports has developed its own specialized technology and manages the media production, post-production and distribution in-house. In this way, the company can satisfy the sailing fans, the general audience, the media and the sponsors by tailoring its products and services. Icarus is also managing the commercial rights for various sailing events and federations, such as the 49er class, the International Kiteboarding Association, the Korean Sailing Federation and others.